Scandvik Stainless Steel, Ceramic Marine Sinks and Basins, the Best Marine Sinks, Basins, Faucets and Fittings Available, High-End Marine Sinks and Basins. 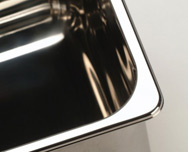 Stainless Steel is the best choice for marine sinks. It makes sense to have good quality marine grade sinks to withstand the harsh marine environment. Stainless steel is resistant to extreme temperatures and can be used with everything from hot pots and pans to ice cubes. 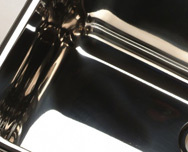 Stainless steel is more forgiving to glass and dinnerware if accidentally dropped in the sink, it is more durable and will last a lifetime without losing its inherent qualities. Scandvik stainless steel sinks match modern kitchens and galleys using stainless steel designs for appliances. Stainless steel sinks installed outside subjected to the sun are not affected by UV rays which can discolor other sink materials. 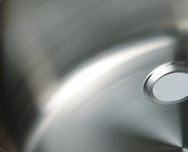 Stainless steel is sanitary and will not hold bacteria making it a safe place to prepare foods. 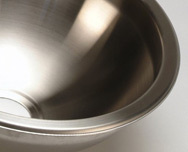 Scandvik stainless steel sinks are made from an alloy of 18% chromium and 10% nickel referred to as 18/10 stainless steel and is considered the best for corrosion resistance and durability. Scandvik stainless steel sinks are 18-20 gauge (1mm) thickness which provides a strong, durable but still lightweight sink. Offered in a large variety of shapes, sizes and finishes, a Scandvik stainless steel sink will give your boat the ultimate sink for galley, bar and grill, head, bait prep station or utility areas. Basins - are characterized as a sphere cut in half. Drains are typically centrally located at lowest point of the bowl. Rectangular - sinks are characterized by vertical sides with either a centrally located or off-center drain location. Cylindrical - sinks are characterized by having vertical sides with an off-center drain. Double - sinks are characterized by two bowls side by side with either centrally located or off-center drain locations. 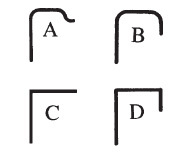 There are four flange styles. The flange style for the sink will be shown with the part number. Install drop in top mount sinks with a bedding compound of silicone or caulk. Top mount sinks can be installed under counter mounted, however, we recommend you consult with an experienced carpenter. This flange is specifically designed to be mounted under the counter top.